We have met so many people in Kirkwall but it simply doesn’t end. There are quite a few characters that will make the player go “ah!” even though Hawke has absolutely no idea who they are. A dwarf named Harrowmont who is the last survivor of his family line. The Knight Captain Cullen in the Gallows. We hear bits and pieces from Ferelden, but they are more to give the player a sense of continuity than actually important to Hawke. What is important to her is, that she gets into all kind of trouble. For instance when she is supposed to find a half elven boy named Feynriel who is secretly a mage and plagued my such horrible nightmares that he ran away. Cassia goes looking for him and convinces him that the circle is where he should go for help. Mainly because she fears for repercussions to both his mother in the alienage and to the Dalish should he run off there. Who knows how far the Templars actually go to find a fugitive? She certainly doesn’t. Plus the circle is supposed to have scholars, she is sure if anyone can help him it is them. That of course leads to another shouting match between her and Anders. Most of the time they get along by now, even considering the other a friend somewhat, but some topics make everyone else in the group suddenly get a very strong urge to check out the scenery and admire the local flora. Someone in Kirkwall’s hightown enlists Cassia’s help to look for his missing wife. Together with an older Templar with investigating other disappearances she gets to play CSI Kirkwall. With gruesome results. They find nothing but a bag of bones and a ring indicating that the bones belong to the missing wife. Aveline promises that the guard will look into the matter more but it leaves a bad aftertaste in everyone’s mouths. Prats of that quest led to the Blooming Rose, Kirkwall’s version of the Pearl and Cassia finds out firsthand that they have a sense of humour when she requests “the bad girl special” and ends up with her entire group together in front of a chanter preaching the chant of light to them. Later a chantry sister hires Cassia to get a Qunari mage out of the city and into freedom. The sight alone is absolutely horrifying to her. Lips sewn shut and in a sort of collar that seems to respond to a control rod like a golem. Of course she wants to help. She would even do that one for free. Of course nothing goes to plan and it was all a set up. The chantry sister, named Patrice, wants to provoke more outrage against the Qunari in the city and set the whole thing up in a way that ideally would leave both the Qunari mage and his heroic protector Hawke dead to fuel some outrage. Of course Cassia doesn’t let herself be killed easily. But in the end she can do nothing to the mage who opts to take his own life rather than to live outside the Qun. 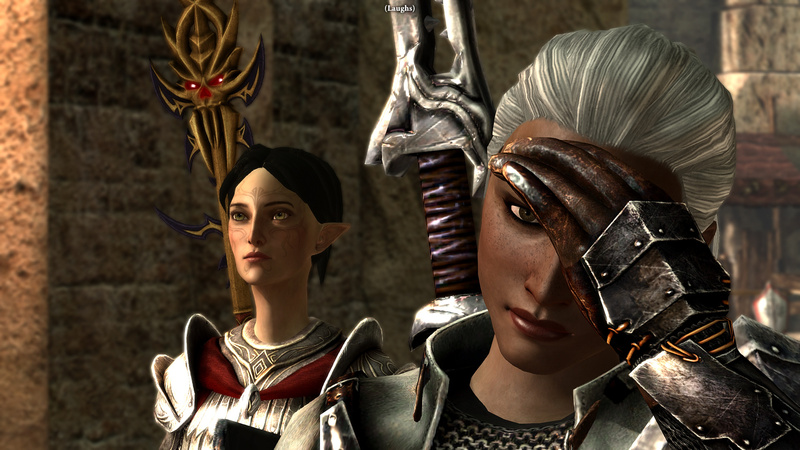 Her tells her she is more like Qunari than she realises and she doesn’t know what to make of that. seriously? how stupid does the game thinks Hawke is, giving us this choices in front of a Tempalr??? Through her actions with Feynriel a Templar named Ser Thrask approaches her to help with a delicate situation: Some mages that were being transferred from Starkhaven after the circle there burned down have gone rogue. He wants Hawke to go looking for them hoping that she will have a chance to talk to them and bring them back peacefully. Cassia tries her best but the leader of that group attacks her almost immediately. After he is taken care of the other mages try to convince her to help them escape. And she is almost inclined to let them for a moment until they say the wrong thing to her: All she would have to do is kill Ser Thrask. The one Templar that actually wanted to help Feynriel instead of just hunting him down. And that wanted to avoid bloodshed. The no falls from her lips faster than anyone could even draw their weapons. And in the end, even if he wouldn’t have seemed like a good man, Cassia would not have been prepared to kill a Templar. She actually wants to stay in Kirkwall, she has a family that she is the sole provider for. She will not do anything that jeopardises that. she convinces the mages to give themselves up and avoids further violence. For now. She also gets to know the Qunari and the Arishok first hand when she gets conned into a deal by a shady dwarf. The Arishok seems to be impressed by her directness and her practicality. She doesn’t really understand the Qunari and their faith but she kind of respects their consistency and their dedication to their rules from what she has learned so far. Not much later she gets asked to save the Viscount’s son Seamus who has apparently been abducted. Only to find out that this abduction was quite voluntarily. He ran off to be with one of the Qunari warriors that doesn’t survive the “rescue efforts” of a bounty hunting group. Seamus seems to have gained a sort of understanding for the Qunari that his father and the other politicians in the city seem to lack. Hawke gets around more and more, slowly getting the money for the expedition together. She clears out a mine that has been overrun by a small dragon and it’s offspring and even gets offered a partnership afterwards. She slowly becomes somewhat of a businesswoman. When she and Varric finally go to Bartrand with their plan, the maps and the money he seems convinced and she is in. Cassia takes Carver with her because he would never forgiver he if she didn’t. Even tough their mother strongly disapproves. But seriously, that is the same woman that blamed Cassia for Bethany’s death not 5 minutes after it happened. She is known for emotional outbreaks that may not actually be very reasonable. (Then again, she IS a mother, I can understand where she is coming from) Additionally Cassia decided to take Anders with her. They don’T get along very well but he is a grey warden and knows how fighting dark spawn goes, so for her he is the obvious choice. Gameplay wise he is also my healer so of course he goes…. Varric is a locked in party member that is obligatory. The group finds an idol completely made out of lyrium and that is when the treachery part starts: Bartrand locks them into the vault after taking the lyrium idol and leaves them to rot because he really doesn’t like sharing. Varric is pissed at his brother, Hawke is cursing and then they agree to find another way out. Encounter some rock wraiths and a demon feasting on their hunger that offers them a deal. What is it with every demon wanting to make a deal anyways? Are none of them overconfident and think they can do everything alone? We say no thanks because we actually want XP more than a quiet journey and fight our way through to the big super rock wraith. That one actually has a boss mechanic! And you notice immediately that I am a MMO player because I go “uhhh, boss mechanic, shiny!”. Because this one plays really similar to some SWTOR fights I played. Which ultimately makes it very easy. Monitor the boss, see when he makes a signature movement, hide behind a pillar and then start fighting again as soon as the AoE disappears. I upped the difficulty towards the end of Act 1 because the fights got boring. And while it seemed that from easy to normal all it did was make the enemies last longer now on hard there seem to be different mechanics going on as well. More enemies can stun you, know you down and work with aoe effects you better not stand in for too long. Makes it a bit more interesting imo. After we defeat the big rock we find a large treasure behind it. And, conveniently, a key to the only door in this place. But it is not over yet… On out way out Carver collapses. He has the taint and is dying. Luckily for us we have Anders with us who knows that other wardens are nearby. And even though the warden in charge, Stroud, really doesn’t want to take a recruit we can convince him to take Carve and let him go through the joining after some arguing and some fierce insistence of Cassia that they would be lucky to have someone like her brother because he is awesome! They say their goodbyes quickly and she promises him to look after their mother and then Carver is gone and the camera moves away from a Cassia standing there felling very alone. Once they return Bartrand is long gone. They have been underground for weeks. Cassia returns home and has to tell her mother that, yes, Carver is still alive or so she hopes at least, but he will most likely never come home again. And on that depressing note Act 1 ends. Cassia is already kind of special to me. And I think I know why. Whenever I make a character that isn’t completely good, that makes choices in game that I wouldn’t make, I put a lot of thought into their backstory and their motivation. Same with Lynn in DAI. Cassia is a blood mage that seems to support the circle and the templars in act 1. More than seems. To a degree she really does believe in chantry rhetoric. Not enough to give herself up because she feels a strong sense of responsibility for her family. She is the sole provider and because of that she can not afford to piss off the wrong people. she is terrified of being found out and compartmentalises encouraging others to go to the circle. She grew up in a loving home that accepted her as she was, but deep down she always questions: what if they only said I am ok the way I am because they are family? What if the chantry is right? Why if magic is inherently evil and dangerous? There is a part of her that she would ever admit to, that hates magic and by extension hates herself a bit. Additionally until she arrived in Kirkwall she has only ever seen mages being taken to the circle or apostates doing their best to hide what they are. Anders is the first mage she meets that speaks out against the treatment of mages out loud. That actually does something against it and it terrifies her. In the beginning she is convinced he is utterly reckless and stupid for doing that. She also doesn’t understand risking your life constantly for people you don’t even know. She’d do it for her family, maybe close friends. But someone else? No. That set of beliefs is challenged a lot in Kirkwall and she is slowly becoming a more open person that actually starts to rely on others a bit. And then Carver gets hurt because of the expedition. Because she insisted he should come even though her mother begged her to leave him at home. The months until she hears from him that he survived and he is fine are the hardest ones in her life. And kind of a setback in her character development. Act 2 will change a lot for her. LOL, the “Bad Girl Special”. I had that as well the last time around, and it was indeed not what I had expected. Anders’ armor looks awesome (and Cassia’s). I don’t think that raising the difficulty would make the fights in this game more interesting for me, though. The fight mechanics simply are this game’s greatest weakness. I would like a mod that prevents the repeated waves of enemies dropping from rooftops or spawning in previously cleared alleyways (did they hide in barrels as I passed them, or what? ), because that is seriously ridiculous. I agree that DA2 definitely has the weakest fight mechanics of the three games. On higher difficulties I still have some fun though. Quite a few enemies gain additional skills, knock downs, stuns etc. It’s not as fun as in DAI, not nearly. But bearable for me.